Best of the Week: Focal Utopia, Sonos Playbase, Sgt. Pepper reissue, New 4K Xbox and more | What Hi-Fi? 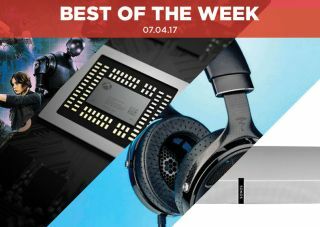 A round-up of the main highlights of the week, including Focal's Utopia headphones and more details on Microsoft's Project Scorpio. This week there are more details on Microsoft's Project Scorpio 4K console, Apple Corps and Universal Music detailed a huge reissue of Sgt. Pepper's Lonely Hearts Club Band and LG has shown off its home cinema line-up for 2017, including the SJ9 Dolby Atmos capable soundbar. In reviews, we have Focal's Utopia headphones, a soundbar alternative in Sonos' Playbase and B&W's 805 D3 standmount speakers. It's also new What Hi-Fi? week, with the May issue now on sale. There's plenty for any home cinema/hi-fi enthusiast with reviews of a Sony 4K TV, Blu-ray players under £100, a set-top box showdown between BT, Sky and Virgin and budget turntable fight between Audio Technica, Dual and Sony. You can buy the issue from your local newsagent, subscribe or buy the digital versions on Android and iOS. MORE: May 2017 issue on sale now! Microsoft is gearing up to launch a new gaming console later this year and, thanks to an exclusive reveal from Digital Foundry, we've gleaned more details. Codenamed Project Scorpio, it will come with a 4K Ultra HD drive, HDMI 2.0 and support for Dolby Atmos. Microsoft also expects games to output in native 4K. With E3 not too far away, we can expect to hear more about the console (perhaps even see it) at the gaming convention scheduled for June. To celebrate its 50th anniversary, Apple Corps and Universal Music are preparing a huge reissue of The Beatles' Sgt. Pepper album. There will be different versions available, but most fans will want the six-disc set. It includes unreleased recordings, a 144-page hardback book and 5.1 mixes on Blu-ray and DVD. It's due to be released on 26th May, priced £110. You can view the set over at Amazon. LG is set to jump onboard the Dolby Atmos bandwagon with its SJ9 soundbar. It can be controlled with Google Home, Google's answer to the Amazon Echo and comes in a 5.1.2 configuration (it includes a sub and up-firing speakers). It's priced at £1000 although there does not seem to be a concrete release date for it. "Focal has aimed for the moon when it comes to performance"
These headphones from Focal are nothing if not hugely ambitious. The Utopias sound wonderfully refined and smooth, with plenty of weight and authority and bags of composure. These high-performing headphones are among the best we've heard. The main issue is the price. But if you can afford it, the Utopias are some of the most talented headphones out there. "What Sonos offers is simplicity, style and a stunning sonic upgrade over any and every flatscreen telly in existence"
Soundbars can often be a tricky piece of kit to find space for. So Sonos has entered the market with its Playbase - a soundbase that sits under the TV. It's an aesthetically pleasing, solid sounding effort with an impressively wide soundstage. The harsh treble and lack of hi-res audio support may irk, but if you favour simplicity and style, then the Sonos is a fine solution to tinny TV sound. "These B&Ws don’t come cheap but they are excellent speakers"
The exterior design of B&W's 800 series has hardly changed in the past decade, despite there having been plenty of changes under the skin. And taking the 805 D3 as evidence, B&W is still maintaining its high standards. In a word they are excellent. Their ability to uncover low-level detail is superb. Add superb dynamics, impressive stereo imaging and there's no doubting they're a hugely capable pair. They don't come cheap, but the 805s are a class-leading pair of standmounters.